for a great Macintosh puzzle-maker? Whirlwind WordSearch is a powerful and easy-to-use word search puzzle maker. It creates uniquely engaging word search puzzles from your own lists of words... in many different languages! You will be building and printing professional-looking puzzles right away. You can choose from many built-in puzzle shapes, not just the usual boring square. The puzzles can range in size from as small as 4 letters across and down, all the way up to 50 by 50 letters. Whirlwind WordSearch has some advanced features that create robust "classroom-safe" high-quality puzzles. It double-checks every puzzle it creates, and makes sure that each of your words only shows up once. It also removes any randomly-created "naughty words" in each of its supported languages! As you increase the difficulty setting, it will add more tricks into the puzzle, ensuring a tougher solving experience. You can save your word search puzzles for opening again later. 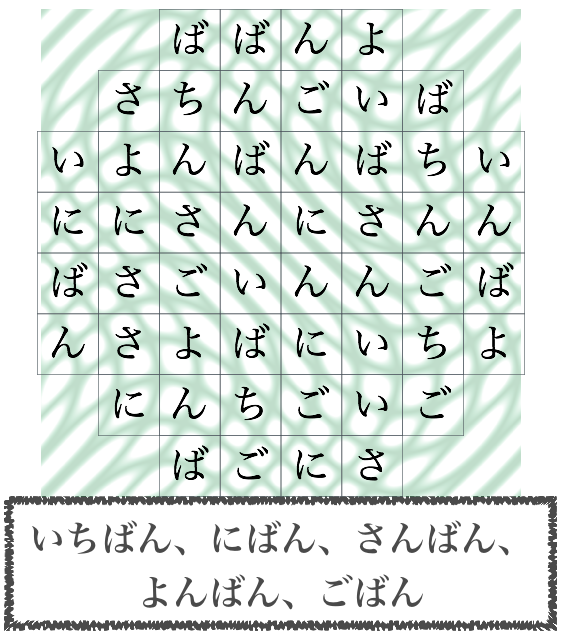 When you re-open them, you can re-print them, or create new puzzle shapes and sizes from the same word list. 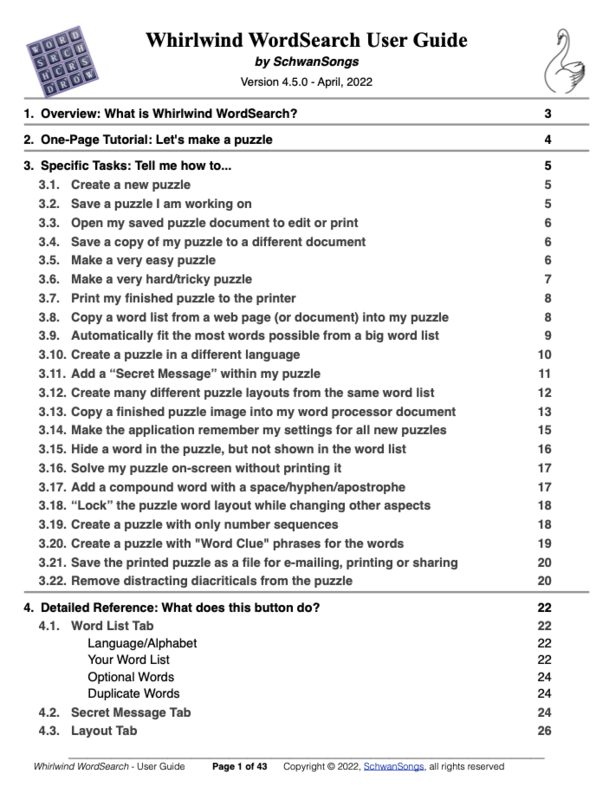 You can also easily copy and paste the high-quality puzzle and answer (PDF) images into your own word processor for re-printing in books, newsletters, or classroom handouts. Supports many languages/alphabets besides English... You can create puzzles with words in French, Spanish, Swedish, German, Russian, Japanese (hiragana and katakana), Danish, Hungarian, Romanian, Turkish, Greek, Sanskrit, Dutch, Ukrainian, Catalan, Portuguese. Easily enter your word lists. Type them in or copy/paste a list from your word processor or the web. Choose from a wide variety of unique built-in shapes: Box, Circle, Heart, Diamond, Bow-tie, Pinwheel, X, UL-Wedge, LL-Wedge, UR-Wedge, LR-Wedge, Checkers, Square-hole, Donut, Right-Arrow, Left-Arrow, Up-Arrow, Down-Arrow, Plus Sign, Up-Triangle, Down-Triangle, Crescent, Cross, Onion Dome, 4-Clover, Square-Peg, Round-Hole, Mushroom, Pentagon, Hexagon, Octagon. Supports Dark mode and Full-Screen mode. Easily enter your word lists, even import them from your word processor or the web. 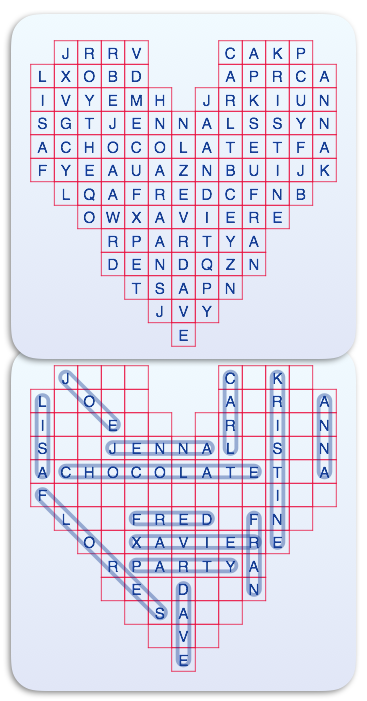 Add an optional "secret message" into your puzzle, which will be inserted between your words as a secondary puzzle to solve. 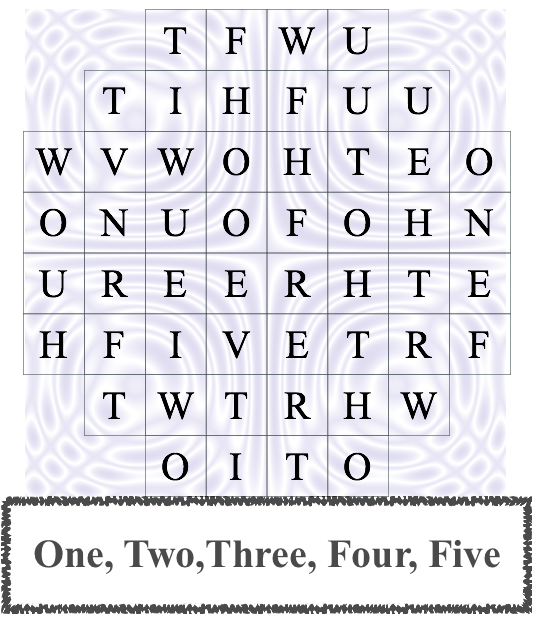 Work without a net... You can run Whirlwind WordSearch anywhere... you never need an internet connection to create, save, and print your puzzles. Save your puzzle word list files, and open them again later to instantly create whole new puzzles, or share them with other Whirlwind WordSearch users. Tailor the display and printing options to suit a variety of audiences and needs. Includes a comprehensive User Guide that contains tutorials and tips and describes every option, getting you up-to-speed right away. Advanced features are explained, helping you create high-quality puzzles. 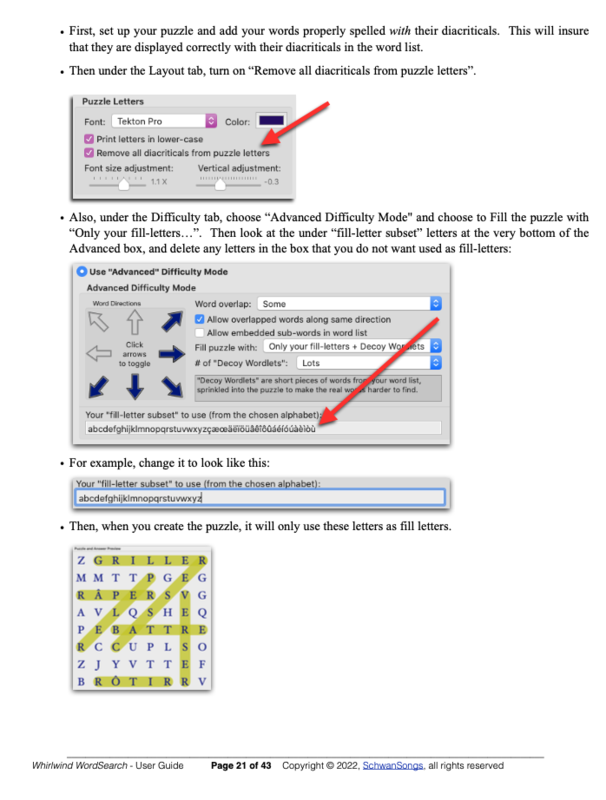 Copy and resize the puzzles and answer keys (as PDF graphics or text) right into your own newsletters, worksheets, books, or other publications, or print them for handouts. A built-in spell-checker alerts you to any misspelled words in your word-list before you print. Create puzzles in upper or lower case, serif or sans-serif fonts. Whirlwind WordSearch checks your word list for any duplicate words. Whirlwind WordSearch thoroughly checks the final puzzle and removes any randomly-generated duplicates of your words. 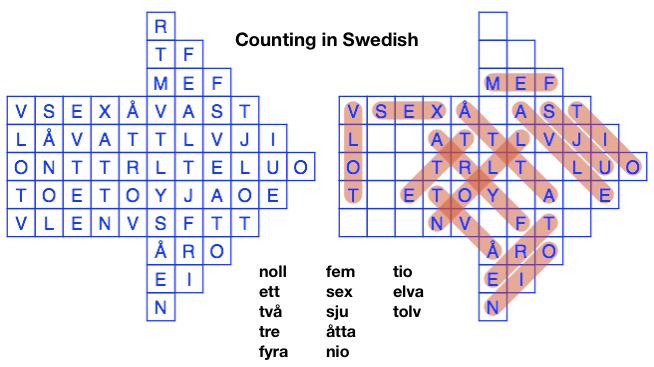 Whirlwind WordSearch also removes randomly-generated "naughty" words in your chosen language! 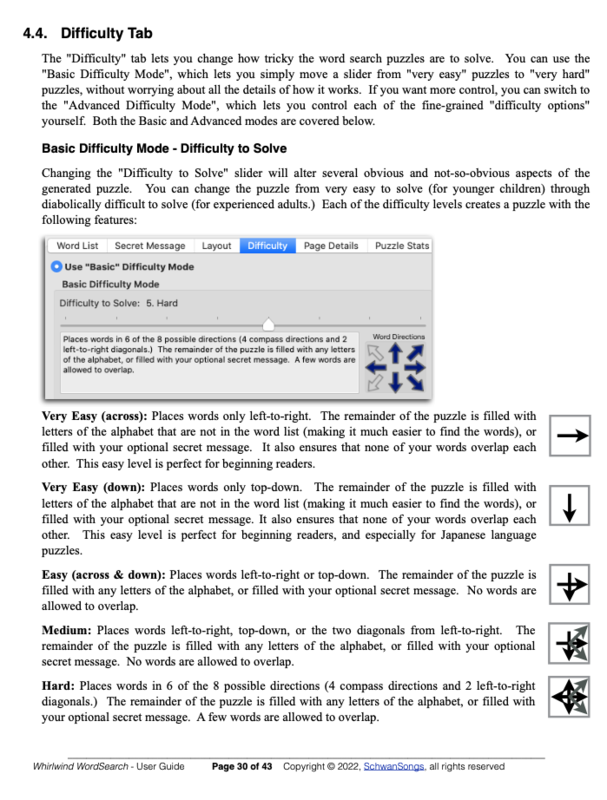 Simply increase the difficulty slider from "Very Easy" to "Diabolically Difficult", and the software automatically adjusts many subtle aspects of the puzzle, changing how tricky it will be to solve. This lets you quickly fine-tune your puzzles so they are appropriate for early learners or puzzle savvy adults. 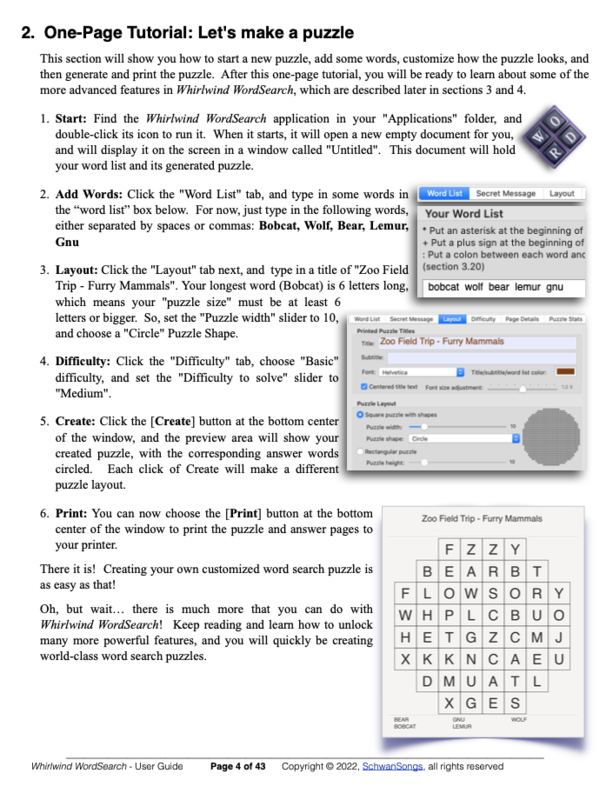 Whirlwind WordSearch is regularly priced as a $9.99 (USD) application, with all future updates FREE. Available now for any Intel Macintosh, Mac OS X 10.9 and up. Big User-Interface Update! Merged the Puzzle/Answer grids into a single larger grid display, and moved the "behind-the-scenes" options out to checkboxes underneath. Support for "Dark Mode" display on macOS X 10.14 (Mojave). Still has support back to Mac OS X 10.9. Puzzle grid now maintains nicer 1:1 aspect ratio as you resize the window. Added 4 new shapes: mushroom, pentagon, hexagon, octagon. Added Dutch, Ukrainian, Catalan, Portuguese languages. Added a new even-more-difficult level, with more decoy words sprinkled in puzzle. Allowed main window to get a little smaller (1100x640) for smaller screen sizes. Detects and removes even more dirty words in each language. Added "# of puzzle words" to the Puzzle Stats page. Smarter calculations of how long it should try different puzzle configurations before giving up. Now when you start generating a puzzle, the progress bar and progress text displays right away, letting you know that something is happening. Minor clarification to some error messages. Added musical easter eggs (to icons in main window). Q: Can I make my own puzzle book with these puzzles and sell the book? A: Yes you can... Any puzzles you create using Whirlwind WordSearch are completely yours to give away or sell. Q: Can you add another language for me? A: Probably, however... it does take some research and work to add a new language. Please E-mail me with your proposed language, and let me know if *you* are willing to help a little with it. Q: Can I print the User Guide? A: Yes you can... simply choose it from the Help menu, and when it is displayed (in the Preview application) simply print it from there. BLOG: If you are interested in a deeper behind-the-scenes Blog/essay on the creation of this software, please visit my blog entry here. If you have more questions about Whirlwind WordSearch or wish to send me feedback... contact me here! Visit my main SchwanSongs web site for other cool stuff! Apple, the Apple logo, Mac, iMac, MacBook, MacBook Pro, MacBook Air, macOS, iPhone, and iPad are trademarks of Apple Inc., registered in the U.S. and other countries and regions. App Store is a service mark of Apple Inc.